You can move it to another document folder within the project or to a document folder in another project at any time. This allows you to reorganize documents as needed. You can move one or more documents in the same operation. You cannot move a document while it has an open review. Note: To move a document between projects, you must have document administration permission in both the source and destination projects. Using the document tree, find and select the folder containing the document that you want to move. Select the document you want to move, then click Move. The Move Files dialog box appears. 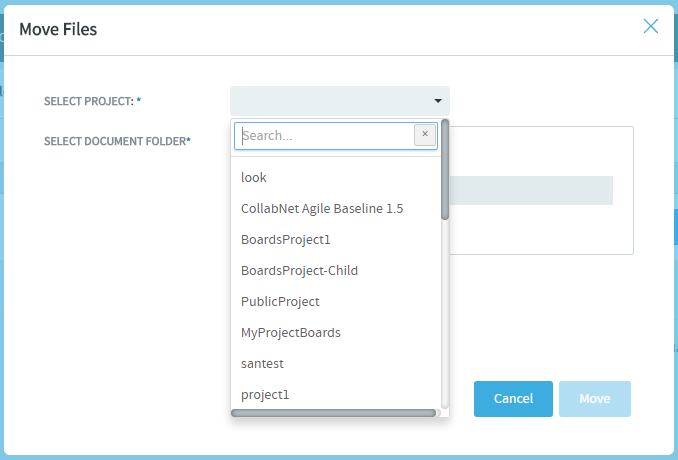 Select the project from the Select Project drop-down list and select the document folder where you want to move the selected document. The document is now moved to the selected folder.